Our door knockers have been very popular, but we frequently get asked questions on what type of door they can be fitted on to and how they are fitted. So, we have taken the opportunity to write a detailed blog hoping to answer some of your questions. Can I fit my door knocker to a composite door? Yes! Our range of door knockers are suitable for any wooden, UPVC and composite doors. How do I attach my door knocker? All of our door knockers are relatively simple to fit to your door, even if you have little or no DIY experience. Every door knocker that we stock is supplied with the correct fixing that is required, meaning that you don't need to rush out to your local hardware store and search for a suitable fixing! Surface mount fixing - securely screwed in from the front of the door with screws. Through the door fixing - securely attached with bolts that go through the whole door. This method of fixing involves screwing the door knocker into a door from the front, with no fixings visible from the rear side of the door. 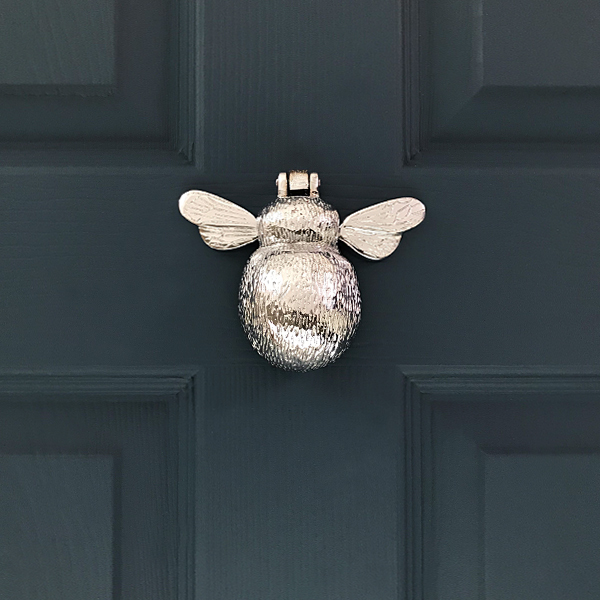 The following knocker designs are attached using this method: Chrome Bumble Bee, Nickel Bumble Bee, Brass Bumble Bee, Chrome Owl, Nickel Owl, Brass Owl, Brass Fox. The first step in attaching a surface mount fixing door knocker is to position the door knocker on your chosen door, ensuring that it level and at the correct height. Once in position, with a pencil, mark a dot on the door through each of the screw holes so that you have a visual marking on the door of where the knocker will be fixed. The next step is to drill small guide holes where you have marked on the door. These holes will ensure the screws go into the door easily without damaging the door's surface. You will require a drill and a 1-2mm drill bit. Be careful not to drill all the way through the door, for this type of door knocker you should have no visible fixings or holes on the rear side of the door. Place the door knocker back into your chosen position on the door and using the screws provided screws, screw the door knocker into the door. Ensure that the screws are tight and the door knocker is securely attached before letting go! Now, step back and admire your new door knocker! Fitting a through the door fixing door knocker is slightly more complex. This method of fixing involves drilling holes all the way through your door and bolting the door knocker into position. This type of door knocker results in the fixings being visible inside the property. Although this type of door knocker is more 'difficult' to fit than its surface mount counterpart, it is generally more secure and there are no fixings visible from the outside. The following knocker designs are attached using this method: Chrome Dragonfly, Nickel Dragonfly, Brass Dragonfly. The first step in attaching a through the door fixing door knocker is measure the spacing between the fixing positions on the door knocker. For our Dragonfly door knockers, you will require two holes; one for the door knocker itself and one for the striking plate. Once you have this measurement, select your chosen location for the knocker on your door and using a pencil, mark a dot on the door where each bolt will be located. Using an electric drill and an appropriate sized drill bit, drill holes all the way through the door. Once you have completed this step, clean the holes that have been created so that they are free of dust and wood shavings. Place the striking plate bolt provided with your door knocker through the correct hole, ensuring that the nut is on the inside of the door. Next screw the bolt into your striking plate to securely attach it to the door. Once the striking plate is securely fitted to the door, insert the second bolt into the designated hole and screw it into the door knocker. Use a wrench to tighten all bolts. All of our bee-utiful Bumble Bee Door Knockers are cast in two parts. The first being the back plate which has wings attached and two screw holes in so you can fasten it to the door from the front with the two screws that come provided. The second part is the bees body which knocks against the striking plate. The weight of the bee ensures that a good knock resounds from the door knocker. Size: 130mm wide x 105mm high x 40mm projection. The wise Owl Door Knocker is cast in two parts, like the bee. The first being the back plate which is fasten to the door using two screws that come provided. The knocker can be attached from the front of the door, thus making it a really easy fixing. The second part of the knocker is the bulk of the owl which is hinged onto the back plate. The beautifully detailed owl can then be lifted up and used to strike against the back plate to create a real solid knock! Size: 140mm high x 75mm wide x 50mm projection. This intricately detailed Dragonfly Door Knocker is hinged at the end of the tail using bolts that come provided with the knocker. The head and the tail are the only parts that touch the door. The dragonfly's wings hover over the door while the head of the dragonfly is used to tap onto the striking plate. 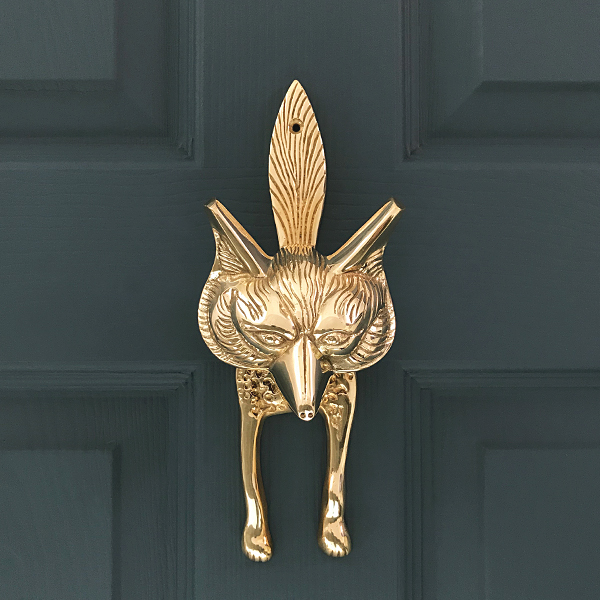 This fantastic Fox Door Knocker is attached to the door with 2 screws, one through the tail and one through the body. The foxes head hinges at the top and is used to strike against the body. Size: 250mm high x 95mm wide. There is 120mm between the screw holes centre to centre. If you have any further questions, please get in touch with us via email or send us a DM on Instagram and we will get back to you as soon as we can!